Welcome to my Fitness Resources page! This page is an ongoing compilation of resources related to all things home fitness that I will add to and adjust based on my experiences. Feel free to bookmark this page for future reference at your convenience. Weight Bench & Plates Set. If your budget allows, I also recommend getting a weight bench, a barbell and plates. 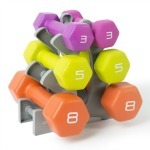 You don’t need this right away but a set is helpful if you prefer free weights over DVDs. I typically use a combination of both. I love the structure of fitness programs on DVD but I also love being able to mix it up with heavy deadlifts, squats and bench press sometimes. 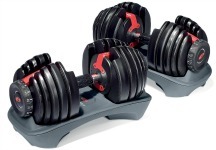 We started with a Gold’s Gym brand Olympic weight set (purchased from Sports Authority) that worked very well. We ended up giving that set to my dad after my husband built a squat rack (he’s a welder :). We now use the squat rack with a Bowflex adjustable bench we purchased from Amazon.com.